MoviePass launched in June 2011 with the mission of getting Americans off of their couch and into movie theaters with a subscription service that allows users to see one movie a day for a flat monthly fee. MoviePas was able to grow their user base to over 3 million, but what they weren’t able to do is make money. Last year, 2018, was plagued with never-ending press about MoviePass’ failing business model, outages and significant changes to service. While we all sit at the edge of our seats watching the plot twists of MoviePass, we wondered, “are subscribers staying tuned for the final scene?” The short answer is, no. We analyzed about 400 million transactions of our users over the last year to determine who is still taking in the action with MoviePass. What we found is that MoviePass has experienced significant churn (the rate at which users cancel their subscription) over the course of the last year—a total of about 58%. The most significant increase in churn happened in June and July after it was reported that the company only had enough cash to keep the business afloat for a few more weeks. In addition to a significant amount of churn, we’ve seen MoviePass pass subscriptions decrease significantly across our user base. The percent of our user base with MoviePass subscriptions has plummetted 76% despite. Who are (or were) MoviePass users? We were curious too. At Moviepass’ peak (July) about 7% of our user base aged 18 to 34 years of age are Moviepass subscribers, compared to just 4% of 35 to 54-year-olds. However, when it comes to income, it seems that all income-levels seem to be enjoying the $9.95 per month subscription—with about 5% adoption rate across all income levels. And while we see the highest rate of subscription (10%) in New York, where the company was founded, we also saw high rates of subscription (9%) in Utah, Oregon, Hawaii, DC and Colorado. The top 10 cities with the highest subscription rate are Los Angeles (15%), New York (14%), Portland (12%), Nashville (12%), San Francisco (11%), San Jose (11%), Arlington (11%), Seattle (10%), Orlando (10%) and Oakland (10%). While the demise of MoviePass seems all but inevitable, it seems as though loyal moviegoers are going to stay tuned until MoviePass calls “cut”. 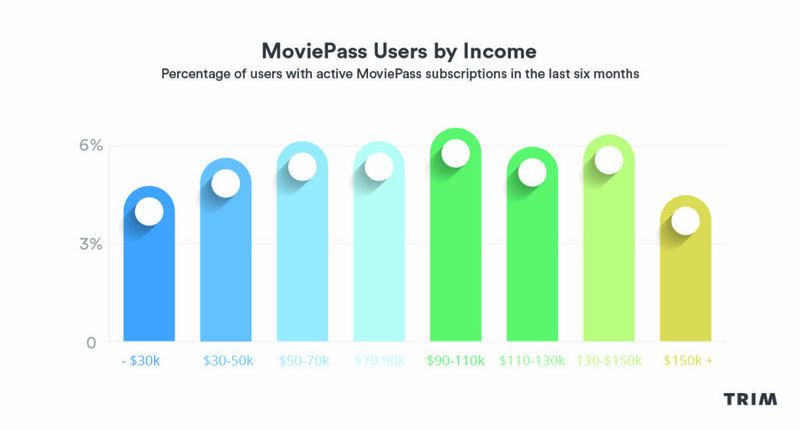 Demographics – determined by the percentage of MoviePass users in the cohort within the Trim user base.